The Floor is Jelly is an excerpt of minimalism. Each area of the world produces a new set of platforming mechanics intrinsically designed to complicate, but never confuse. Each has a new color palette, carefully selected to set the tone and atmosphere in a world of jelly that should inherently seem funny; each a new set of increasingly intelligent puzzles, masterfully thematic soundtracks, and clever secrets akin to nostalgic platformers before them. There are no enemies, no explanation of controls, and no dialogue, but Ian Synder’s latest game is so deceptively brilliant that when I reached the credits I shivered. The journey begins in an unconventional way, a core tenant that carries throughout. On display is a circular blob of blue jelly with no indication of what the player should do. Pressing an arrow key will move the jelly, and players may do that for a while until they bump into a little white dot. The screen fills with coloured jelly; whites, blues, and oranges begin to swirl around, following the player and shrouding them. Eventually, the swirling jelly molds into the shape of the world, and the game begins. 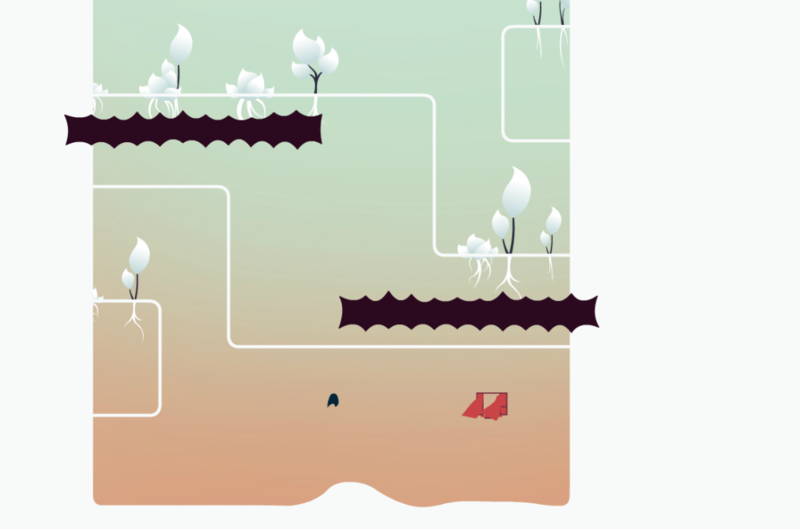 On a basic level, The Floor is Jelly is a puzzle platformer that feeds off of player instinct. As the player spawns, now as a faceless black blob with legs, the world ripples below their feet. I’m sure everyone will be different, but my instinct was then to jump. Jumping causes the floor to sink downwards before springing back up in a jiggly, elastic manner. Without any visible controls or tutorial, I had taught myself the timing mechanics of how to jump high and jump low, all while enjoying the physics of the world. The Floor is Jelly continues this method of teaching for all of its mechanics, including the imperative momentum-based wall-jumping. Even the secret levels are intuitively hidden in such a way that had me saying “oh I know there’s going to be a secret there.” The Floor is Jelly creates a rewarding system based entirely on fun and making the player feel clever. To complement the player’s cleverness further, The Floor is Jelly’s puzzles are increasingly smart. Each of the eight areas have a different set of mechanics that the game brings to light. The opening tutorial levels consist of simple gaps to jump across, or modest heights to reach, but later levels force players to think through their run of the level beforehand. Despite having no enemies, the game does have deadly, spiked jelly (the pointy kind, not the alcoholic kind) that will kill upon impact. The game consists mostly of polished, existing puzzle platformer elements, such as world-rotating puzzles, which are, for the most part, linear. The Floor is Jelly shines most however, when it’s completely unique. One area has sectioned platforms that only come into existence if the player is pressing an arrow key as they touch an edge. By falling into a section, the player can then make the platform spawn inside-out in order to further navigate the level. These are some of the toughest levels in the game, and require both patience and problem-solving. 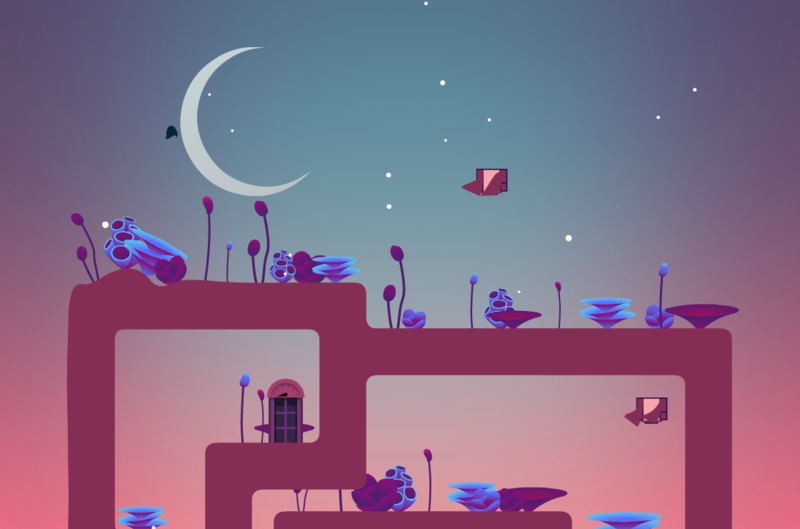 What The Floor is Jelly does even better than its level design, is its sense of atmosphere; from its opening sequence, the game is beautiful and mysterious. As players progress, the daylight colors and peppy music of earlier levels begin to dim into night; progress through the three day-to-night cycle levels to unlock a new batch of three. Along with the deeper palette of colors, the music transitions into smooth jazz, melodic piano, and other calming ambiance. The entire soundtrack is so perfect at developing mood and atmosphere that it rivals producer Disasterpeace’s acclaimed work on Fez. The mystery of the world is further exemplified by secret, empty houses. Tucked away in hidden windows (the gateways between levels), players will find little houses with computers in them. 31 of these exist, and the mystery behind their purpose is captivating. It isn’t until the last two areas however, that the game reveals itself for what it is. After conquering the six main areas, players unlock a black-and-white space level. In it, almost everything the player has learned is turned on its head, as the physics system is completely skewed by these low-gravity levels. Pacing is also effected, as players must now take levels more slowly to avoid death– a complete departure from the previous levels that required speed and momentum. All the while the Disasterpeace soundtrack, now evocative of 2001: A Space Odyssey, sets a bleak and dangerous tone. Passing the challenging space levels unlocks one final set of pink levels that change the game up even further. Each is home to a different chip-tune song that matches perfectly to their respective level’s individualities. The game plays against mechanics and expectations, and it’s at these points that the mutual interests of the game’s designer and the player themselves is coherent. The Floor is Jelly is the heart of the “indie game experience.” It’s a designer coming up with something new, something outlandish, and something impossible to do in a mainstream landscape. It’s a game that speaks, cooperates, and intrigues its players. It’s a game where both entities, the designer and the player, can speak to one another. “I want there to be a secret back here,” the player says. “Okay, I’ll do that for you,” says the designer. “I want to try making this crazy level,” the designer then says. “That’ll be fun; I’ll try it,” the player responds. The Floor is Jelly is a conversation between players, and between the games that inspired it. It’s the intelligences of Braid and Super Meat Boy mixed with the mystery and humor of World of Goo and Fez. It’s everything we’ve come to expect from an indie title, and yet it still manages to defy those expectations in ways that only brave, independent game designers can. It’s a world made of jelly that is captivating not because of gimmicky humour, but because, when the rain pounds down onto the floor amidst a chilling piano track, it jiggles. It’s two years of love and effort in the making, and it shows in every moment. The Floor is Jelly is a pleasure to experience. Each area introduces something new, interesting, and exciting. It’s an inspiring display of artisan talent from its choice of gradient color scheme, to the programming behind the physics of its world, to its hauntingly perfect soundtrack. It does whatever it wants, and whatever it can, but its intrigue never drags the player along. The Floor is Jelly is a mastering of the independent game. An PC review code was supplied by the developer.